A MENSWEAR shop is enjoying the Daniel O'Donnell effect on business after fitting out the country superstar with sharp new suits for his comeback tour. Tony Riordan was delighted when the crooner popped into his Cork city outlet to get a brand new look for himself and his seven-piece band, after an 18-month sabbatical from music. Daniel and his musicians were kitted out with a number of on-trend suits for a fashionable return to the stage after an almost two-year absence. Mr Riordan (55) described Daniel as a “fashion icon” among fans and especially women hoping to get husbands and boyfriends dressing as smartly as their idol. He said the Donegal star (54) has a tall, lean frame and is a "dream to dress". "Daniel is a model figure to dress. He keeps in great shape and the clothes hang very well on him," he said. "The brief for the new outfits was to give Daniel and his band a sharp, on-trend look. Daniel also needs fabrics with a bit of stretch in them for dancing on stage." 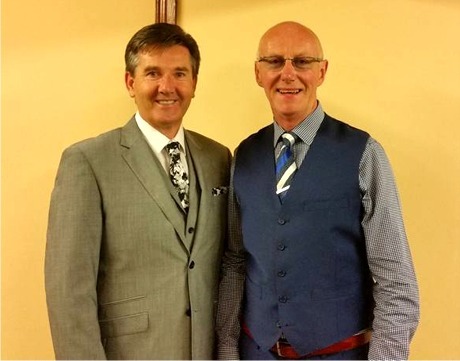 Suits you sir: Daniel O'Donnell pictured in a new Carl Gross three-piece along with his Cork outfitter pal Tony Riordan. The businessman, who owns Tony's Menswear on Marlboro Street, and the crooner go back over 25 years. They first met when the Munster man started taking regular holidays in the singer's native Donegal in the early 1990s. Their long friendship has resulted in Daniel choosing the Cork outfitter on a number of occasions including his honeymoon wardrobe for his wedding to Majella in 2002. "I did all Daniel's casual clothes for the wedding apart from the wedding day suit itself." The retailer of 28 years said many people don’t realise that Daniel makes about three costume changes per concert. This time, his devoted audiences can look forward to seeing the popular performer in a sharp, three-piece navy blue suit with beige piping by Marc Darcy; a mid-blue suit with shadow-check by Torre and a silver-grey mohair three-piece by Carl Gross. His band were similarly kitted out in fashionable grey-checked ensembles with black velvet trim. The new outfits also feature the latest in stylish waistcoats, crisp shirts and a variety of fashionable neck ties. All are "in-demand, up to the minute trends", added Tony. Meanwhile, apart from the several thousands of euro the singer spent on his stylish new tour wardrobe, Daniel’s custom is also good for business long term. "People come in the door and say 'you dress Daniel, would you have something similar for my husband or boyfriend?'. Daniel is a great fashion role model especially for men in the late-30s to mid-50s age group. His style is sharp, chic and elegant."